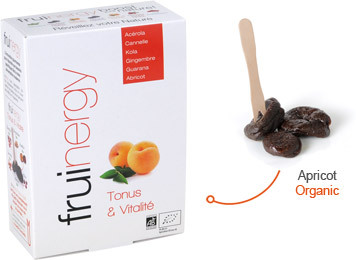 fruinergy Energy & Vitality combines the natural wealth of apricot with a choice of plants traditionally used for being resources in energy. Acerola (Malpighia), a small berry from the Andes, naturally concentrates the Vitamin C a true antioxidant vitamin. Cinnamon (Cinnamonum zeylanicum) helps fighting against the feeling of physical and mental weariness. Ginger (Zingiber officinalis) has toning properties and reinforces vitality. Guarana (Paullinia cupana) and Kola (Cola acuminata) support the organism in producing the necessary energy and mental and physical abilities. Naturally rich in magnesium and source of Vitamin C, fruinergy Energy & Vitality contributes to reducing fatigue. The synergy of fruits and plants nutrients resulted in fruinergy Energy & Vitality being a revitalizing and stimulating mixture during physical and intellectual efforts. fruinergy Energy & Vitality is made with environmentally friendly techniques. Its carefully selected ingredients add up to a high quality product with authentic taste.